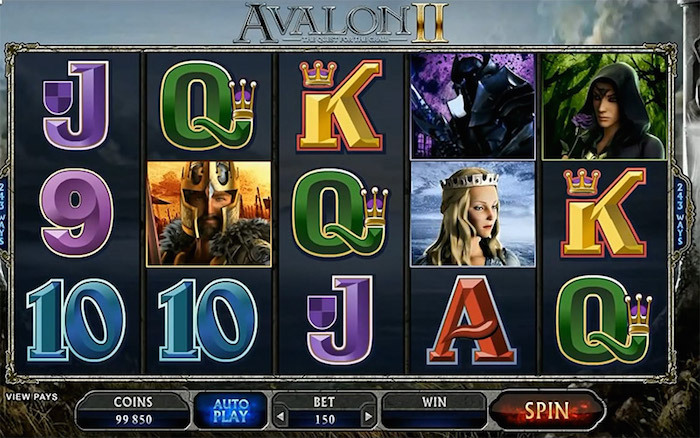 Constructed by Microgaming, the Avalon II slot is online casinos most sort after fantasy game. The sequel to the popular original Avalon slot. King Arthur’s quest for the grail demonstrates the finest in cutting-edge casino playability. The legend is brought to life in this medieval masterpiece. With five reels alongside Microgaming’s solid 243 ways to win layout. The game follows the story of King Arthur. The journey to find the grail and return it to the Isle of Avalon, the land that forged Excalibur. The Avalon II Slot takes players on a journey like never before. With the inhabitants of Camelot included throughout and a number of spectacular bonus rounds. Yes, it’s epic! What can we say, from the very first spin following the slots formidable introduction it’s clear that Microgaming spent a lot of pennies on this one. Gone are the days of simply spinning and watching the reels, hoping to win a few quid with three red cherries. It’s online casino at its very best, a slot which tells a story and takes players directly through it. 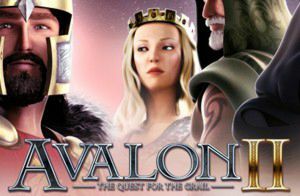 Whether its gambling for real money or just looking for the free play stuff, Avalon II will astound those who choose to take on its Quest to find the Grail. With superb 3D graphics, captivating sound effects and interactive features, the Avalon 2 online slot holds incredible gameplay. Next in the Avalon II Slot review we’re going to look at the slots five reels and the valuable purpose of their components. First up and Microgaming have armored the card values 10, J, Q, K and Ace with a medieval finish to push out the lower cash prizes. There’s also Camelot locals Merlin, Morgan, the lovely Guinevere, King Arthur himself and a nasty piece of work the Black Knight. Arthur is the highest paying character with 100 coins returned for 5 of a kind. If you want the big payoffs, you’re going to need a more important feature or icon. The haunting lady in the lake is the games expanding wild, an old chalice plays the bonus symbol and the Avalon 2 slot logo is the standard wild. All of which are crucial for winning decent amounts of money during gameplay. Like other online slots from Microgaming, the Avalon II Slot uses a bonus interrogator (chalice symbol) which triggers a much larger bonus round containing multiple and individual games. You’ll need 3 x chalice symbols to activate the interrogator that is the grail bonus, ultimately giving you access to this mythical world and all the treasures (cash) contained within it. The grail bonus includes the following levels: whispering woods, lake of legend, forest falls, dusky moors, Morgan’s keep, misty vale, hall of shadow’s and the ultimate reward isle of Avalon. It’s a road map to riches with each location en route providing free spins, various activities to win cash, extra wilds, multipliers and rolling reels. Merlin and the expanding wild “lady in the lake” can also appear randomly and at any time to help boost your cash pot. Already Avalon II has a major reputation within the real money casino community. Players who can spin it’s reels for the relative low cost could pocket its legendary 2,400,000 coin jackpot, one of the largest non-progressive jackpots in gaming history. Total coins in play range from 30 – 150 with five coin levels of 0.01 to 0.05. For the mathematicians out there, that’s the cost per spin of 30p to £7.50. Avalon 2 has a payout rate of 95.92% (theoretical RTP) and pays a decent 200 coins for its 5 of a kind “WILDS”. Not bad when you consider the cost to play it. Remember this title has several bonus rounds too and claims to offer up to £120,000 for the best drops.